There are several different types of hard drives you can use in your homebuilt computer. For purposes of assembly, the type of interface is the important difference. At the time of this revision, PATA drives are obsolete, but are still available if you need or want to use them for some reason (such as if you're upgrading an older machine rather than buying a new one). SATA (Serial ATA) hard drives are the new standard. Most of the information about PATA drives has been moved to a legacy page for historical reasons, but I seriously doubt you'll need it. SCSI drives are still available, but very few home users choose SCSI drives because of their high cost, their complexity, and the lack of any real advantage over SATA for the vast majority of users. The case that was used for the illustrations in this site had a detachable "cage" for the hard drives. This is still a very popular design because it eliminates the need to remove the side of the case behind the motherboard to access the mounting screws. In a case of this design, the cage is first removed from the case, the drives are mounted into the cage, and the cage is reinstalled into the case. This design speeds up assembly and helps reduce scraped knuckles from working in tight spaces. As a former (now-retired) computer tech, I like this sort of case design because it makes it a lot easier to remove and replace the drives if the need arises or if you want to upgrade in the future. Another nice case design allows the drives to be installed from the front of the computer by simply sliding the drives in or out. The SATA connections are built into the bays or installed as attachments to the bays. Most server-style cases use this method, making them a good choice if you either want the ability to easily add and remove drives frequently (for example, if you do data recovery work), or if you plan to install a lot of drives in your computer. For this project, however, the builder used a case with a hard drive cage. 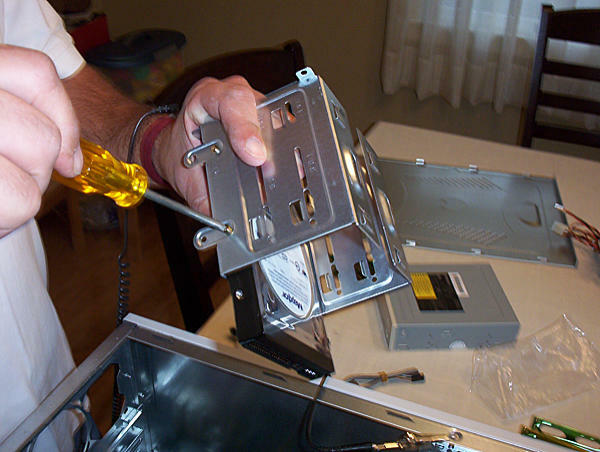 In this picture, he is installing the hard drive into the cage using four mounting screws. This is still how most drives are mounted, but some case designs eliminate the need for screws by using tabs or brackets. Screwing a hard drive into the case may seem simple, and it is. But it's also an opportunity to mess up your drive. Make sure that you use the correct screws and that they're properly threaded into the holes. Don't force them. The screws and the holes are easy to strip. If the screw doesn't want to turn, try turning it backwards until it seats itself. Also make sure that you use the correct holes so that the cage will fit back in the case properly. There are three holes on each side of a 3.5 inch drive, but usually you only use two of them. Which two you use determines how far forward or back the drive will be mounted and weather it fits into the case properly. 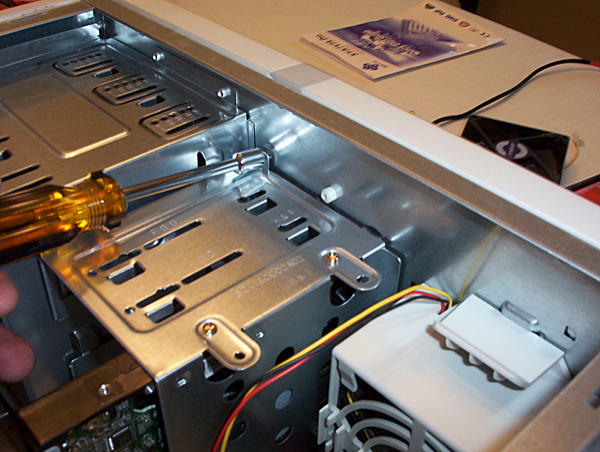 If you are mounting a front-accessible drive (such as an optical drive, floppy drive, ZIP drive, or card reader) in the same cage, then make sure you mount the front-accessible drive in the position behind a suitable opening in the front of the case. If you don't need that bay for a front-mounted device, you usually can use it for a hard drive if it's more convenient. 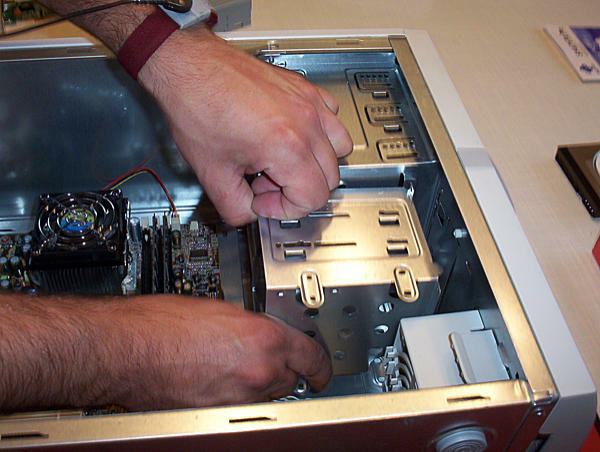 In this picture, the builder is reinstalling the cage into the computer case after having fastened the hard drive to the cage. A lot of people ask me, "Is it really necessary to use all four screws to mount the hard drive?" My answer is yes if you're using HDD (spinning disk) drives. Using four screws reduces the chances of annoying buzzing caused by vibrations. Yes, it can be a pain to reach all the screw holes sometimes. But it's a more professional way to build a computer and will help prevent noise problems later on. Some cases use friction mounts or rubber bushings to reduce hard drive vibration. Using them will help reduce your computer's noise and may help protect the hard drive from external vibrations (such as accidentally hitting the computer with your foot while sitting at your desk). If you're using SSD (solid-state drives), then you should still use all four screws if it's at all possible. But because they have no moving parts, using two screws to mount an SSD is acceptable if it would be a real problem to reach all four. If you'll be using an SSD drive, you may need a 2.5 to 3.5 inch bracket like the one shown here to mount it in your case. All SSD drives (at least that I know of) are either 2.5 inch ("laptop-sized") or mount directly on the motherboard. All newer cases have at least one or two bays that will accommodate 2.5 inch drives, but some older cases don't. 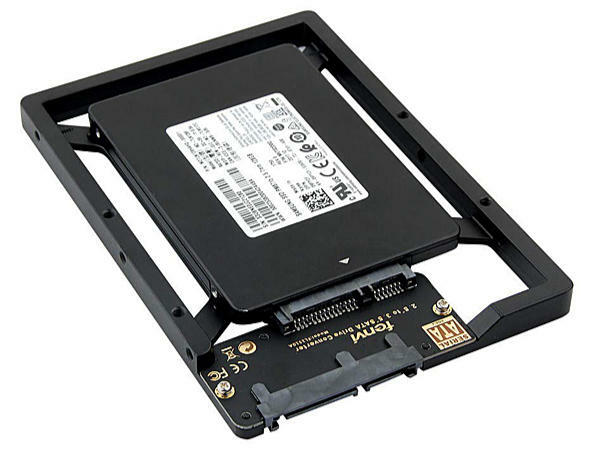 Other times when you would need an adapter like this might be if you want to install more SSD drives than the case has suitable bays, of if you want to install the SSD in a case with drawer-type hard drive bays, like most hot-swappable server cases. This is the type of part that people often skimp on. My advice to you is not to do that, especially if the adapter has any electrical connections. It would be terrible to damage an expensive SSD because you wanted to save a dollar on a bracket. If it has electrical connections, consider a hard drive bracket as important a part as any other electrical component of the computer. If it's just a plain bracket without electronics, and you plan to run a SATA cable to the drive, then pretty much any bracket will do. It's only if it has electrical connections that you have to be super careful. 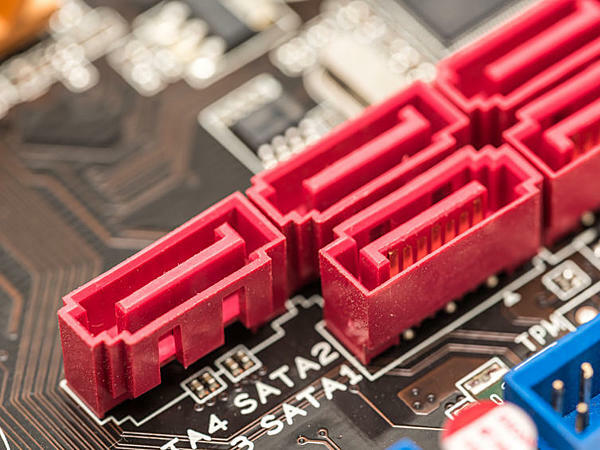 If you are using SATA (Serial ATA) drives, then you don't have to worry about jumper settings or clumsy ribbon cables. The connectors on the motherboard will look something like the one in this picture. On some motherboards, however, they will be mounted flat rather than standing up. The system drive should be attached to the primary SATA controller, which will be the one with the lowest number (either SATA 0 or SATA 1). Other than that, it really doesn't make much of a difference which connectors you use for the other drives. There are no master / slave relationships to worry about, and no jumpers to configure. Once end of the SATA cable should be inserted straight down into the connector, and the other end to the drive. The cables and connectors are keyed to prevent improper attachment, but don't force them. They're just plastic and can be broken or deformed very easily, in which case your motherboard or drive will be ruined. Look at the cable and the connector to make sure they're keyed correctly, and then gently try to connect them. If you encounter resistance, you're probably trying to attach it backwards. Finally, attach the power connectors to the drives. There are two kinds of connectors that attach to hard drives. The one on the left in this picture is a SATA power connector, which is used on all current SATA drives. The one on the right is called a Molex connector, and is still used on all but a few PATA drives. 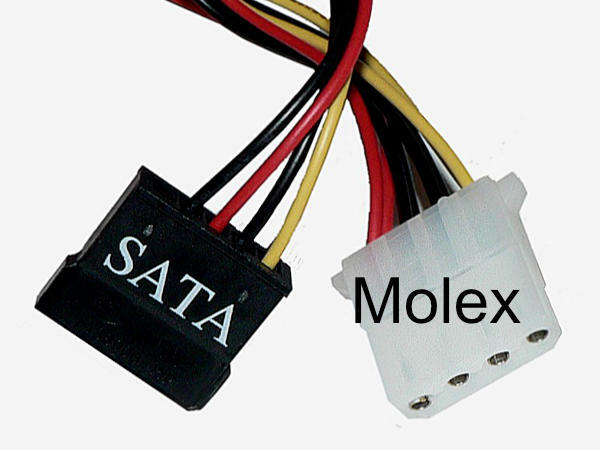 The voltages are identical, and Molex-to-SATA power adapters are available if your power supply lacks enough connectors of the correct type. Whichever connector you use, make sure that the power connectors are attached using the correct polarity. The sockets and connectors are shaped so that they will only fit the correct way unless you force them. But they're just plastic, so you could deform or break them if you tried hard enough to attach them in the wrong direction. So as with the data connectors, double check that you have the polarity correct. If the connector doesn't seem to fit the cable, then you're either using the wrong kind of connector or you have it backwards. If you fire up the computer while a drive power connector is attached backwards, you will immediately and permanently destroy the drive, and probably the power supply and the motherboard. So make sure you double check to make sure that all the connectors are attached properly. Next, let's look at Installing Auxiliary Drives.